There’s something wonderfully enjoyable about great 1971 Dead shows. The band was so comfortable by now that its entire concert experience could be equally appealing for its lovely folk-rock good times song delivery, as well as for the band’s ability to reach the psychedelic seas. Coming out of 1970 after releasing both Workingman’s Dead and American Beauty, two albums that completely reshaped the way everyone had to think about this band, the Dead’s persona had evolved a long way from being the poster child from 710 Ashbury and the Summer of Love. 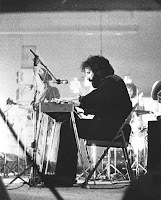 The Dead rolled into their featured night during the closing run of Bill Graham’s Fillmore West as a well polished (as much as being the Grateful Dead would allow them to be polished) cosmic country rocking titan. 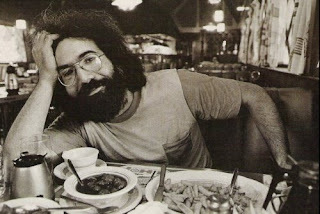 Steeped deeply into the nearly two year period where they toured with the New Riders of the Purple Sage as their opening act (really more of an extension of the Grateful Dead family than another band, with Jerry Garcia playing pedal steel in the Riders), the Dead’s concerts from 1971 exude happiness more than anything else during this period. It’s an odd overarching accolade to bestow, especially while the band was probably more multidimensional in 1971 than most people think – pure folk-tinged timelessness, raw bluesy Pigpen-driven swagger, and the ever present psychedelic power. But through all of this, the band simply sounds content and comfortable. It was a good time to be the Grateful Dead. 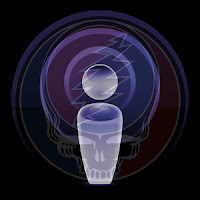 07/02/71 offers a perfect slice of the Grateful Dead pie, or perhaps an entire pie, since we have the complete evening’s performance to enjoy from a collection of recordings made off of the FM-Broadcasts of the show. Having things complete, there is an uncompromising need to begin one’s enjoyment of 07/02/71 with the New Riders’ opening set. As much as the Dead were masters of their game by 1971, the Riders were completely hitting their stride here, and this date offers a fantastic example of how wonderful the New Riders of the Purple Sage were. This was one of the first New Riders tapes I ever got in a trade, and it came as a gift, just something included with a number of other shows from a trading partner. I wore the tape out. The reference Bill Graham makes in his introduction to the Riders being one of the things that makes Marin County as sunny as it is seems to suffuse their set completely. Having personally collected pretty much every available note in circulation from this band, I can attest that the Rider’s set on 07/02/71 is spun from pure gold. Not only is Garcia completely on fire with his steel playing, but the band is just completely in synch from start to finish. John “Marmaduke” Dawson’s vocal drip like honey, and the band epitomizes their own special brand of psychedelic country rock. As you go from song to song, and hear the crowd going more and more bananas in appreciation, you quickly come to find how this band’s music was a critical feature of the Dead’s entire output over 1970 and 1971. The evening with the Grateful Dead starts here. The Riders cap their set off with an encore of The Band’s song, The Weight, and if you could take only one NRPS performance to a desert island, it may as well be this rendition (which, by the way, can be heard featured in the bonus material on the re-mastered release of their debut album). Garcia’s solo will teach you never to miss another opportunity to listen to the Riders again. As Dawson continues to deliver the verses after the solo, you find that you are cradled in a little meadow of golden streaming sunlight. Dust specs sparkle like tiny glass prisms. There’s no place else to be. And the Dead have not even taken the stage. When the Dead do take the stage, sunshine explodes as they open up with Bertha, a song more at home here in its debut year than any other. Jerry has clearly drawn all the energy from the Rider’s set directly into his vocal delivery. And his solo absolutely sings over the equally charged energetic delivery from Bill Kreutzmann on drums. Perhaps it’s from being the opening track on the Dead’s live album, Skull & Roses from 1971, and that being one of the first GD records I bought as a youth, but to me Bertha embodies 1971 Grateful Dead beautifully. It’s like the bands calling card for this year. The joyfulness is unmistakable, and by the end of the song, when the instrument mix is completely dialed in, we can tell we are in for a wonderful sounding ride through a night with the Grateful Dead. Me & Bobby McGee follows and the pervasive comfort and pleasure continues. We are less than ten minutes into this show, and we’re already wrapped into the Dead’s vibe completely. Also a song featured on the Dead’s ’71 live record, Garcia’s backing vocals have always struck me as so well thought out on this song. He’s not simply harmonizing. He’s threading his own melody line just under Weir’s. Following Bobby McGee, Pigpen steps up for Next Time You See Me (a song, by the way, that was mislabeled as “Lied & Cheated” on many an old Dead tape), and the Dead demonstrate that they still pack that throaty, bluesy strut and swagger that was such a primary force in their music early on. Pigpen blows fantastic harmonica, and the crowd can be heard exploding in appreciation of his talent. This is followed by a China > Rider which hammers everything home. 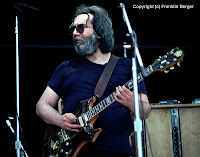 Garcia’s guitar tone blazes into the air during the China Cat solos, and the segue and ensuing I Know You Rider find the band firmly settled into a dance with what is clearly, for them, one of their most cherished golden rings in 1971. All the sunshine energy and Americana-Folk-like groove that pervaded Bertha and Bobby McGee comes pouring out in the Dead’s improvisational expression. Here then, we lock in and find our hearts entwined with the music. This isn’t the deep soul rending psychedelic madness type of intoxication. Rather, it’s the equally intoxicating flip side of the same coin. Somehow, the Dead’s established ability to psychedelically pierce the heart allows them to guide the audience along into their own evolving heartfelt pleasure during I Know You Rider. We’re early in the show, and already the music has fully transformed the borders between everything around us. The joyfulness of it all has clearly soaked into everyone and everything. The first set continues to deliver on this energy, including a wonderful Hard To Handle. This period of the year was a high watermark for Hard To Handles, containing freight train-like energy and power through the pounding solo section. This version is also worth noting for showcasing the amazing ability of the band to save itself after a mistimed vocal re-entry on the final verse. They right the ship so effortlessly it’s almost as if nothing went wrong. The set wraps up with a steamy and strutting Good Lovin’. Cascading out of the formal song into the rolling and swirling gutsy blues-tinged jam, it’s a wonderful ride into a sweet spot of early Dead jamming style that we would see completely disappear with the eventual loss of Pigpen. The music sweeps everything into a near tribal frenzy, and closes the set on a wonderful high. Set two opens with a rocking Sugar Magnolia, another song that was in prime form this year, and eventually we reach Cryptical Envelopment and Other One. It comes at us as if out of nowhere, a bit like 07/26/72’s Dark Star. There’s little hint that the band might veer down the psychedelic path at this point, and the somewhat unexpected turn adds to the enjoyment. 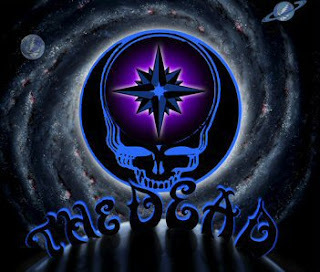 While the mass of this show features that highly infectious “good old Grateful Dead” vibe – something altogether relaxing and smile producing – this Other One reveals the more sinister and snaky Grateful Dead that apparently has been waiting just out of view the whole time. This is a hold on to your seat ride that, even as it gets going, belies the true dangers lurking just around dark corners. We go in not sure that the bottom will ever really drop out on us, and what takes shape is more of a slow dissolve. The song just keeps pushing the envelope as it transitions liquidly from Other One theme to dripping feathery interplay, back to the theme again, and soon gets completely lost in a burning sea of stars, all before making it seamlessly into the first verse. Afterward, the music begins to bow and flex at odd angles as the intensity continues to build. 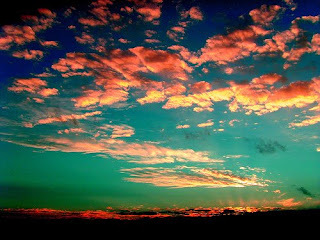 Eventually it all swarms into madness, erupting in great plumes of molten color. Somehow the ground is found within the Other One theme breathing fire like a dragon. Fiercely, the song slams into the final verse, and eventually comes to rest beautifully in a mournful breeze without re-entering a Cryptical reprise at all. The set closing segment begins with a Not Fade Away which storms in and shows off Garcia’s guitar work at its lyrical best. His solo arches high in the air, singing lovely lines while the rhythm section churns along. This provides a certain “pretty” layer not often found in Not Fade Away, and becomes a lovely bridge to an equally luscious Goin’ Down The Road Feelin’ Bad. 1971 was far and away the pinnacle year for Going Down The Road. The band had clearly found something of a sweet spot in this song, much like in that of I Know You Rider. The warm glow of tube amplification, Bill Kreutzmann’s impeccable ability to skim the beat along tiny wave crests, Jerry’s emotional story telling delivery of the lyrics – all of these things and more found a wonderful convergence in 1971. Without bringing the roof down, GDTRFB could nonetheless deliver a peak highlight to any show. Bookending it smoothly, Not Fade Away elevated this even more into a classic Grateful Dead pairing. 07/02/71’s version is fresh from the mold, delivering everything we could ever want. It’s that lovely marriage of Folk-Americana and country rocking rainbows that the Dead embodied so well in 1971. Also not to be missed is the Johnny B Goode encore. Introduced by Jerry with, “Alright folks, here’s the one it’s all about,” this version does indeed bring the house down. The Dead surge with such power here that even this straight up rock-n-roll classic demonstrates that this band was cruising at the top of their game. Fantastic Summer ’71 Grateful Dead all around.